The application has three primary components – the mobile app, a middle tier web service, and a dispatch system interface. The mobile app is provided and maintained by the PulsePoint Foundation. Apps are currently available for the iPhone and iOS device platform and Android devices. One version of the software (on each platform) supports all agencies using the app (there is not a separate app for each agency). A configuration screen within the app allows users to select their desired agency or agencies. Member agencies can also provide a connection to local radio traffic to enable a streaming radio feed within the app. The middle tier is a (Amazon EC2) cloud-based web service that manages communications between the personal mobile devices and the emergency communication centers of member agencies. The service provides encrypted communication and secure identification (HTTPS with SSL/TLS protocol) to connected agencies within a highly reliable environment. This service is also provided and maintained by the PulsePoint Foundation. Emergency communication centers communicate with the middle tier service through an application programming interface (API). An API is simply a set of rules and specifications that software programs can follow to communicate with each other. The PulsePoint API serves as an interface between Computer-aided Dispatch (CAD) systems and PulsePoint services. A CPR notification arrives as a normal push notification similar to the one shown in the left-hand image. This push notification will be accompanied by a distinctive alert tone. Opening the notification will load the PulsePoint app to the incident screen. This screen will display your current location, the general reported location of the cardiac arrest victim, and any nearby Automated External Defibrillators (AEDs). You can tap an AED icon for a text description of its precise location. To receive a CPR Needed notification you must have the CPR notification type selected in the Settings Menu and you must be in the immediate vicinity of a reported cardiac arrest. The app aims to notify those essentially within walking distance of the event location. For Dane County, this radius has been configured to a quarter mile of the event. The Health Insurance Portability and Accountability Act (HIPAA) protects the privacy of individually identifiable health information. 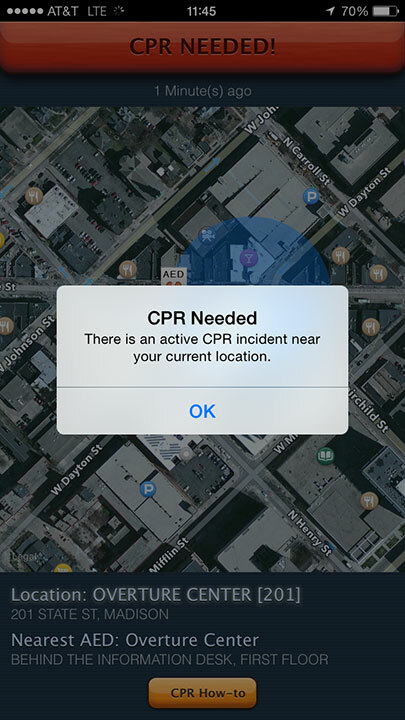 On a 'CPR Needed' notification, the app reports only an address (in a public place) and a business name, if available. Individually identifiable health information, such as name, birth date, or Social Security Number are not reported or known to the PulsePoint application. In addition, PulsePoint has retained Page, Wolfberg & Wirth, LLC to assist agencies understand legal issues related to the implementation of PulsePoint. PWW is well respected EMS law firm specializing in dispatch liability and HIPAA issues. How does the app know if someone is CPR trained or qualified? CPR today is very easy to perform and can be learned quickly in informal settings such as community street fairs, group training sessions, take-home DVD-based courses, or even by watching brief online videos. These types of training environments do not provide certificates of other forms of skill documentation. Automated External Defibrillators (AEDs) actually require no training to use. Therefore, there is no ability or even reason to verify that someone volunteering to help others with CPR or an AED has been formally trained. Learn how you can help save a life in this one-minute American Heart Association video showing hands-only CPR in action. Is there a risk the app will draw too many bystanders to the emergency medical scene? Only about a third of Sudden Cardiac Arrest victims receive bystander CPR, and public access Automated External Defibrillators (AEDs) are used less than 3% of the time when needed and available. The current situation is far too few bystander rescuers – not too many. The goal of the app is to engage additional bystanders in these lifesaving acts. If this situation was to truly materialize in the future it would be a major success and the footprint of the notification could be reduced. How do you prevent someone from using the app to steal from or otherwise take advantage of a cardiac arrest victim? For the app to be activated someone must first call the local emergency number (such as 911) to begin a normal public safety response. This means that the victim is likely not alone when the CPR/AED notifications are made. In addition, the app is only activated for incidents occurring in public places (not at someone's home for example) furthering the likelihood that others will be present. Also, since the app is only activated on devices in the immediate vicinity of the victim, a "Bad Samaritan" has little opportunity to be in the right place at the right time. "A person, who, in good faith, lends emergency care or assistance without compensation at the place of an emergency or accident, and who was acting as a reasonable and prudent person would have acted under the circumstances present at the scene at the time the services were rendered, shall not be liable for any civil damages for acts or omissions performed in good faith." *For more FAQs, please visit the official PulsePoint website.